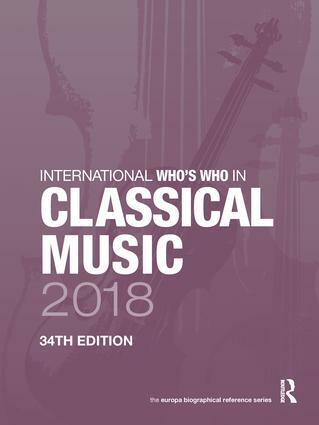 The International Who’s Who in Classical Music 2018 is a vast source of biographical and contact information for singers, instrumentalists, composers, conductors, managers and more. Each entrant has been given the opportunity to update his or her information for the new improved 2017 edition. Each biographical entry comprises personal information, principal career details, repertoire, recordings and compositions, and full contact details where available. Appendices provide contact details for national orchestras, opera companies, music festivals, music organizations and major competitions and awards. International Who’s Who in Classical Music includes individuals involved in all aspects of the world of classical music: composers, instrumentalists, singers, arrangers, writers, musicologists, conductors, directors and managers. - includes both up-and-coming musicians and well-established names. This book will prove valuable for anyone in need of reliable, up-to-date information on the individuals and organizations involved in classical music. Part 1: Biographies Part 2: Directory Appendix A: Orchestras. Appendix B Opera Companies. Appendix C: Music Festivals. Appendix D: Music Organizations. Appendix E: Competitions and Awards.